A documentary feature film about one man's journey across northern India and his search for enlightenment. Rajive McMullen, a history teacher suffering from a debilitating illness, makes the painful journey into the heart of Tantra, searching for meaning in holy shrines, coming close to death in cremation grounds and enjoying the chaos of the Aghori seekers. 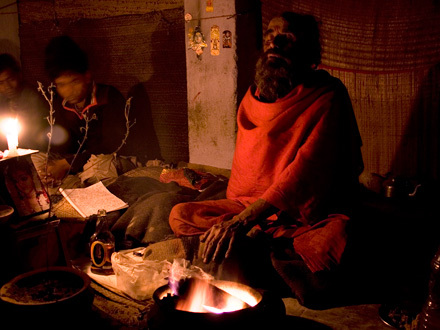 This film offers dramatic insight into Tantrik ideas about the life cycle, particularly death, and contributes much to our understanding of how we seek knowledge and how we die. The Lover and The Beloved also represents a realistic attempt to understand both the practice and illusive theory behind Indian Tantrism, and is intended to challenge widespread Western misinterpretations of this system of thought. Along the way we visit Kamakhya Devi in Assam and Tarapith in West Bengal, two of the most important centres of Tantrik Hinduism.